Just a handful of BISC members competed in the Chelmsford Open on September 13-14. 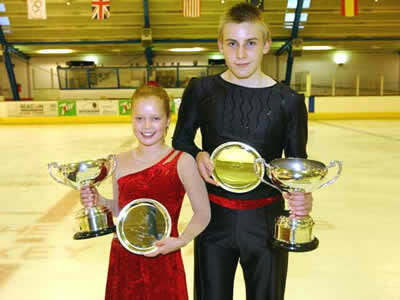 The event gave an opportunity for the club’s novice championship pairs’ skaters, Charlotte Hester and David Truby, to add another trophy to their collection and to show how much they had improved — particularly on the lifts —since their last Opens in the summer. * Charlotte Hester & David Truby. They won the competition, beating two other couples, despite David flinging Charlotte so hard on the thrown salchow that she fell. Robyn Vaughan came 6th out of 6 in the Level 3 girls class while, skating for Basingstoke, Fiona Piggott came 3rd out of 6 in the Level 4 girls’ class, and Claire Miller came 3rd out of 3 in a closely-contested novice ladies’ class. BISC members had a very good day at Swindon on September 20, bringing home six medals from eight entries. Harvey Clarke, aged 6, skating in his second Open, shot up from 8th place at Guildford in the summer to win gold in the Beginner boys’ class while Jordan Brown, 11, skating in his first Open, did really well to win silver in the same class. James Bailey, 11, continued his medal winning streak with a win at Level 1 while his sister Rhiannon Bailey, 7, came 8th in the Beginner girls class. Olivia Clarke, 10, won silver in the Level 2 girls under 12 class and Hannah Hetebrij, 14, won silver in the Level 3 girls, 12 and over, class in which Robyn Vaughan came 4th. Ellie Hetebrij, 10, won her first medal when she skated in an artistic class with Olivia and Harvey Clarke. Their Andy Pandy programme not only won silver but got the highest marks for entertainment. Well done to Kira Geil and Andrew Smykowski for having a good skate in the Ondrej Nepela Memorial competition in Bratislava, Slovakia, where they came 5th in the junior ice dance at the end of September. Nineteen members of BISC’s Ice Fusion junior synchro team benefited from a weekend training camp at the National Ice Centre, Nottingham, writes team captain Sara Holroyd. We spent September 24-26 being coached on-ice by Cathy Dalton, one of the top Canadian team coaches, and working off-ice, including doing water ballet, with Tatiana Wood. We had about seven hours on ice over the weekend, which is more ice time than we get at Bracknell in a month! Cathy taught the team new moves and improved our elements. 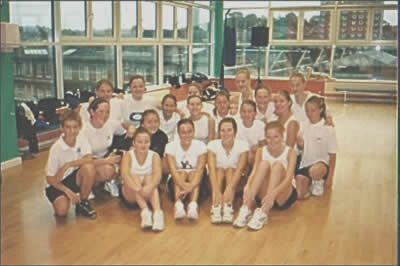 * Ice Fusion prepares for an off-ice class at the synchro camp. Off-ice work with Tatiana included the use of fitness balls which all the skaters enjoyed. She worked on specific muscles that can improve our strength on ice. At the end of the session each skater could feel their muscles, but it was beneficial. Then we did water ballet which was hard. This fun, successful weekend taught each skater something new, and we were left with a positive attitude as we had achieved a lot! The team returned to Bracknell to train hard for the first British Synchro Championships qualifier at Nottingham on October 10 in preparation for the championships in January. Anyone interested in joining the synchro teams should come to our Friday evening session, leave their details at reception or talk to one of the team’s coaches, David Phillips and Lucine Chakmakjian.